China has repeatedly denounced self-immolations as terrorist acts, calling the practice barbaric. Beijing also holds Tibet's exiled spiritual leader, the Dalai Lama, responsible. 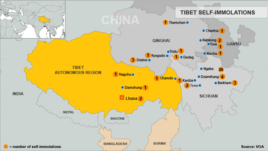 China views Tibet as a non-negotiable part of its territory and has long accused the Dalai Lama of trying to separate the Himalayan region from China. 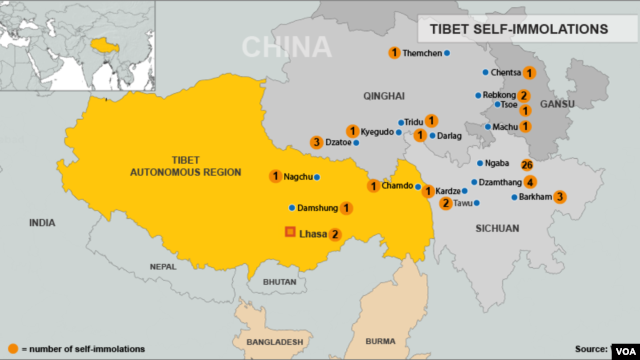 The Dalai Lama has said repeatedly that he is not pushing for Tibetan independence, but for greater autonomy. Tibet Prime Minister-in-Exile Sangay repeated Friday that Tibetans are pushing for autonomy and not separation, suggesting Beijing could use talks to send a clear message. "If they really say 'we believe in moderation' then Tibet is the test, it's not Hong Kong, it's not Macau, it's not Taiwan," said Sangay. "Tibet is the test because once Tibetans are granted autonomy then that is an indication that finally the Chinese leadership or the Han Chinese people have accepted diversity." ELoevx Thanks for the post.Really thank you! Awesome.